SERVED: Award season has begun, or at least that's what E! or Access Hollywood would say just because a show aired that hands out awards. 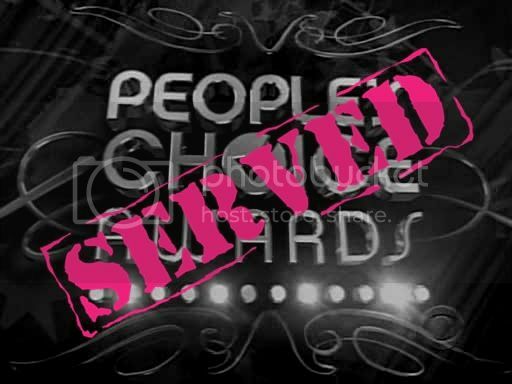 The People's Choice Awards aired and while I had the good sensibility to skip it, I saw many results being tweeted and reported by the media. After hearing some of the winners, I knew the morons who voted for this show needed to be SERVED. Sure some were rightful wins, while some were popularity winners (I love ya House but c'mon...), but seriously who in their right mind would vote critically-panned $#*! My Dad Says as the Best New Comedy on TV? I didn't see Grown Ups with Adam Sandler and friends because it was an obvious turd, yet this wins Best Comedy Movie? WTF?? Sorry people who voted, but you need to be SERVED for having little to no clue on how to vote for entertainment awards. Fingers crossed CBS fixed some of the votes to have their shows (and shows they may not air but produce) win.